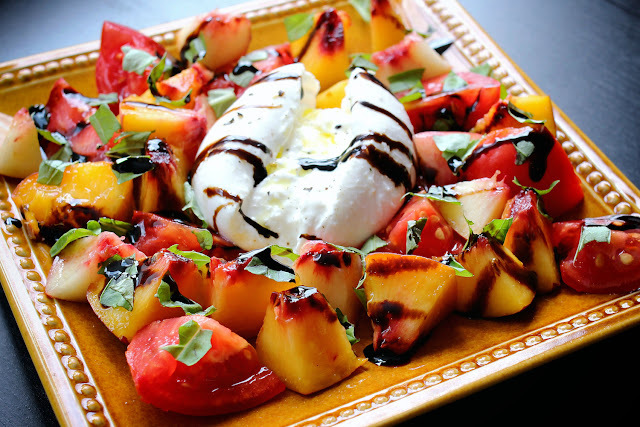 Have you found delicious tomatoes and peaches in your garden, and are looking for the perfect summer recipe? This salad is one of my family's favorites: juicy, soft, and flavorful. Give it a try and it might become your favorite too! The dish is quite simple and it involves no cooking (provided you already have the balsamic glaze). And, as with most simple recipes, the secret is in using high quality ingredients: make sure the peaches and the tomatoes are ripe, juicy, and sweet. - Wash the tomatoes and the peaches, and cut in slices or cubes of roughly the same size. - Add the burrata or mozzarella cheese. - Tear the basil leaves and scatter them on top. - Sprinkle a pinch of salt and pepper. - Finally, drizzle olive oil and balsamic glaze over the salad. - I prefer burrata over mozzarella cheese for this salad. The former is soft and mushy, and looks most presentable in one piece (which I like to slice in the center to reveal the creamy interior). If you're using the latter, you can easily cut it into pieces (about the same size as the tomatoes and peaches), and then evenly scatter them throughout. - The balsamic glaze contributes a bold flavor and nice strong pattern on top of this colorful dish, and as such should be added as the last step. If you're missing glaze, you can prepare it from balsamic vinegar by following these easy steps: bring balsamic vinegar to a boil, then reduce heat and let simmer for 15 minutes, and finally let cool before using.